Action Research is working on a project with the American Forest Foundation (AFF) and the New England Forestry Foundation to learn more about the ways in which private woodland owners manage and conserve their wooded land. In January, Action Research’s President, Jennifer Tabanico, and Director of Research Operations, Lori Brown-Large, traveled to Connecticut to conduct focus groups with local landowners. 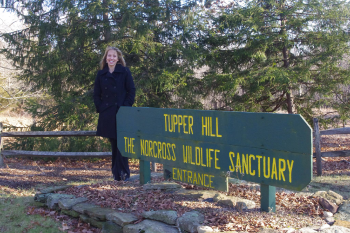 The focus groups were conducted at the Norcross Wildlife Center and the Connecticut Audubon Society. A number of local woodland property owners came out to share their thoughts about forest management and conservation, as well as their struggles, successes, and thoughts for the future. This input and feedback will inform AFF’s efforts to support landowners through information sharing and outreach programs. Action Research is working with AFF on a similar project in the Piney Woods region in southeastern Mississippi. The Action Research team is excited to be part of keeping America’s forests healthy, and is always ready and willing to travel to where ever they are needed. More details about this project will be coming soon! Click here to learn more about Action Research’s previous projects, and follow us on Facebook and LinkedIn to stay up to date on our work.